Eggs should be one of the easiest things to cook. Yet, you manage to mess them up all the time. It's OK. I do it too. That's why I asked the 2009 James Beard Best Chef in the South, Top Chef Masters contestant, and my close personal friend (though he doesn't really think that) John Currence to give me -- and by extension, everyone on the internet -- some foolproof tips on cooking nearly every viable style of eggs. Currence runs several amazing restaurants in Oxford, Mississippi and just came out with a cookbook, Big Bad Breakfast, for one of them. Dude knows his eggs. Even a dummy like me, and presumably you, should be able to learn something from him. An 8in, nonstick pan should be your go-to pan. Always crack your eggs into a bowl first, never straight onto the pan. Always crack your eggs on a flat surface, like a cutting board. 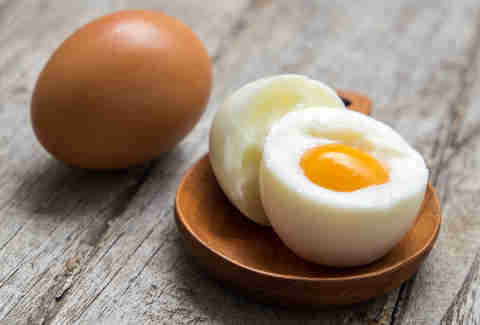 If you use the edge of a bowl or a knife, the edge of the shell will fold into the yolk. If you do get shell in your egg -- don't worry. Wet your finger. It will slide through the raw egg, and you can grab the rogue piece of shell. Solids burn faster than anything else, so use clarified butter or ghee (that's pre-made Indian clarified butter in a jar!) to keep your eggs consistent and free of little black specks. Love your eggs. Treat them well. Get the right equipment: A rubber spatula and a nonstick pan are essential. You want big fluffy curds in there, so make sure you whisk the eggs a lot in a bowl. You can even add a little milk (about 1tbsp) to make sure they're fully fluffed. The more you whisk, the more air gets in the eggs -- and the fluffier they get. Add the clarified butter to a pan on low heat and let it sit for a bit. Then pour your whisked eggs in... slowly. Use a soft-motion stir with a rubber or silicone spatula. 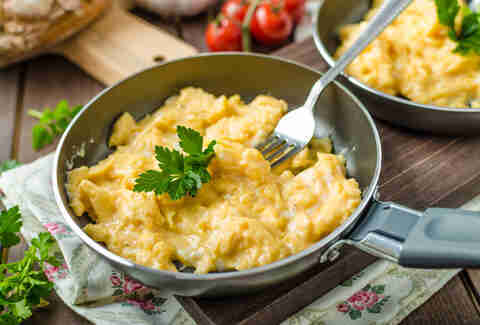 Scrape any big curds off the bottom, and fold them back into the middle of your scrambled-ness. Take them out when they are still moist, but not too cooked. 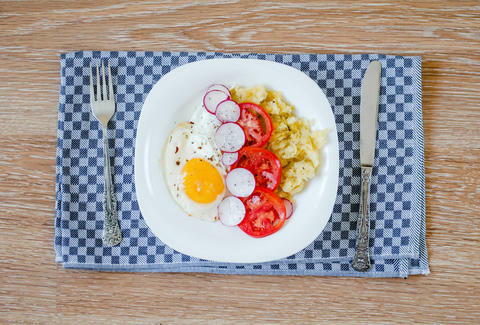 "Over-easy eggs are all about the flip," Currence said. "That's all you need here." Be super careful not to break the yolk. Add clarified butter to a pan on low heat and let it melt. Cook your egg on one side, till there's not a lot of residual raw eggyness left on the surface. Then flip it over, literally for five seconds. It's not that much different than over easy and just as simple to make (if you do it right). Cook the second side almost as much as the first -- after that initial flip, leave it in the pan for another 45 seconds to a minute. The top and the bottom should be cooked to the same degree, with a line of yolk in the middle. When you break the yolk, there should be a little bit of run, but it should mostly be cooked through. Cook it on both sides as much as you want. Just let it roll till you touch it and see the yolk is cooked all the way through. Rejoice with your weird egg of preference! Seems simple enough, right? Still, there are many ways us common folk screw this stuff up. Old eggs peel more easily, so this is a great way to use them up! You can also add a little bit of vinegar (about 1tbsp) to the water, to help give the eggs a better, whiter texture and easier peel. Start the eggs off covered in a couple inches of cold water. Bring the pot up to a boil. Once it's boiling, bring the heat down to a gentle simmer. Let the eggs sit there for eight minutes exactly. Remove the eggs with a slotted spoon, and run cold water over them for about five minutes. "Poached eggs require a gentle touch, above all else," Currence says. "That being said, it's a highly underrated egg dish." Bring a few inches of salted water in a large frying pan to a boil, and turn down to a simmer. For every quart of water in your pan, add 2-3tbsp of vinegar to help the proteins coagulate more quickly (don't worry, the eggs won't take on the flavor). Crack your eggs into a small bowl and pour them gently into the water. Don't worry -- they will all separate when they hit the water. This will ensure all your eggs go into the water at the same time, and are thereby cooked the same. Cook for about two minutes until the whites are firm, but the yolks are still slightly soft. Take a big slotted spoon, and gently scoop underneath each one to make sure they don't stick to the bottom or sides of the pot, with the water at a low simmer. Check out if they are clearly cooked on all sides. Gently set them out on a plate. "There are two keys here," says Currence. "Patience and clarified butter." Crack egg in a bowl or a cup before it goes into the pan. Warm your pan up on medium heat for about one minute. Pour your eggs onto the pan and let them sit for about two minutes. When the whites are almost cooked through (clear and a little runny on the top), put the pan inside your broiler, for about 20 seconds, to finish cooking the top. "This is kind of a deep cut -- but it shouldn't be," says Currence. "Everyone should try their eggs this way." Well, easier said than done. These work great in a Mason jar! Brooklynites love them! Crack two eggs in a Mason jar and add a little bit of salt and pepper. Pour 2.5tbsp of heavy cream over the top with freshly chopped herbs. Screw the top on lightly. Lower it down on the boiling water. Let it sit for about 12 to 20 minutes, depending on your preference (the longer you cook, the harder your yolk will be). Rejoice! With your Mason jar!